Saturday morning I attended a meeting of incredible minds and was taken to my knees at the generosity and brilliance of humanity. One of the leaders of the group shared with us a video of water droplets and the affect of thoughts on the drops of water. Yes thoughts…Water Droplets and Emotion Please watch! Can you imagine how profoundly our thoughts affect our bodies then? Now go and look at what molecules of tears look like… Tears It is hard to deny that we are created to experience emotion and that it is important to our overall health and our relationships to pay attention. This paying attention is mindfulness and contemplation. My mind goes to the depth of our connection to each other and our planet, and the importance of community and love. Our impact in this world can be beautiful and we were designed for that purpose. And then today my pastor spoke about lament. He is basing his series on the book of Job, the oldest book in the Bible. In this story Job loses everything – his wealth, his business, his family and his health. “What I feared has come upon me; what I dreaded has happened to me; I have no peace, no quietness; I have no rest, but only turmoil.” – Job 3:25-26 In a word – trauma – something that I have studied and have a great deal of experience with, and deep heart for, in my work with horses and humans. One thing we all have in common is that suffering is inevitable. Loved ones hurt us, death takes away souls that we long to hold, dreams litter our path, relationships end, financial goals remain out of reach and we get stuck. The grief takes hold of us and our bodies and souls are heavy with it. So, how do we move through and finally past the suffering? Is it possible to heal and thrive even when all hope is lost? We humans are incredibly resilient emotionally, mentally and physically. If our bodies are allowed to process the suffering through mourning and grief, then the places inside of our souls that are burdened with loss, shame, guilt, disappointment and anger can be replaced; cleansed. You see, our bodies actually store trauma at a cellular level. (The Body Keeps the Score: Brain, Mind and Body in the Healing of Trauma – Bessell van der Kolk, M.D.) If our bodies are able to process suffering then why are so many people paralyzed with grief? Because we don’t allow ourselves the opportunity to experience suffering. Speaking from experience, and working with many people who are suffering, it is due to the fact that we are afraid to show sorrow. Honestly, we don’t even know how to grieve! We are afraid to let anyone know that we are sad and we don’t want to burden anyone with our problems, fears and regrets. We fear losing control of our emotions and beings though of as “unstable” or “too emotional”. In some cases, fear of what we have done causes shame and remorse which brings with it feelings of rejection and the worst of all, loss of love and belonging. And on top of that, when we know someone is suffering and we have a heart to help, we don’t know how to be in the moment with them and offer our hearts and support. How tragic that every single one of us has suffered or is suffering, yet we believe that if we show anyone that we are suffering, they will think less of us or even abandon us? What does it look like to stand bravely in our suffering, to allow for the tears and the wailing, the screams of anger, shock and anguish? I was married to a man who is a narcissist for 10 years, was on bed rest for 5 months during the pregnancy of my daughter, two years of infertility treatments prior to the birth of my son, one of my best friends (joyful adventurous mother of 3) was diagnosed with brain cancer and subsequently became a quadriplegic. And then I also grieved the dream of what marriage would be and was regularly told I was worthless, stupid and undeserving of respect and love – I was covered in suffering. The weight of this suffering was heavier than I could carry. I was living in the dark world of survival, checking off the responsibility boxes and carrying on as “I should” with our family and friends. And then the bottom fell out of my world. I found out my husband was having an affair with the worship leader of our church. The married woman who sat next to me in church, who sang with the voice of an angel in front of a huge congregation declaring her love of Jesus. I remember sitting there at his computer screen staring at the email in front of me…” I love you and can’t live without you.” Now if you’d asked me, I could’ve told you that I knew in my gut he was having an affair. But when I confronted him, he would look into my eyes and deny it and call me paranoid. Given my state of mind at the time, his denial just fed the already existing fire that I was obviously going nuts. I was devastated. The pastor refused to support our marriage, we were abandoned by the church and suddenly all of our “close” friends were gone. I think people believe affairs are contagious or something! I was humiliated, lonely, scared and stinging with the betrayal. I lost my church, my friends, my husband’s family and trust in my most sacred relationship on Earth this was suffering. I think a lot of women struggle with identity anyway, as we mother our children and serve our husbands, but when faced with this reality, it was almost more than I could bear. After much discussion, we decided to try to make the marriage work. Fast forward two years past all of the marriage counseling (he claimed it wasn’t for him it was for me), dream vacations to exotic places and gifts to reignite the marriage, I went on a trip to Galveston with my best friend from high school. She and I spent three days at the beach, watching the waves roll in, walking in the surf, talking about our lives and remembering who we were. I remember the night I was walking in the ocean, salty tears flowing and it was as if the water I was walking in began to wash away the many layers I had added to myself in order to survive. I emerged lighter, freer and stronger. Being with my best friend had removed the heavy cloak of the last decade of my life with a man who had not loved me. I remembered who I was and I was joyous! Neck pain that had plagued me for years went away. I could breathe and I knew that I could raise my two amazing children as a single mom! I knew without a doubt I was strong and courageous and a beautiful daughter of the Most High! My perspective had shifted from hopelessness to hope and a renewed belief in who I was and what I was capable of accomplishing. My soul had survived the battle. I returned home after that trip and asked for a divorce. That afternoon I went to the grocery store and was amazed at the new lighting in the store…it was only after a few minutes that I realized the store had not changed the lighting – I was looking up for the first time in years. I was meeting the eyes of the other customers, walking with my head up and had even worn a brightly colored shirt that day, instead of the gray and black wardrobe I had not noticed I was collecting. I didn’t realize it at the time, but I had replaced the suffering with strength. Crying and releasing, surrendering to God, had given me a new outlook. I did not know what the journey held for me, but I did know that the path was bright and just around the corner. 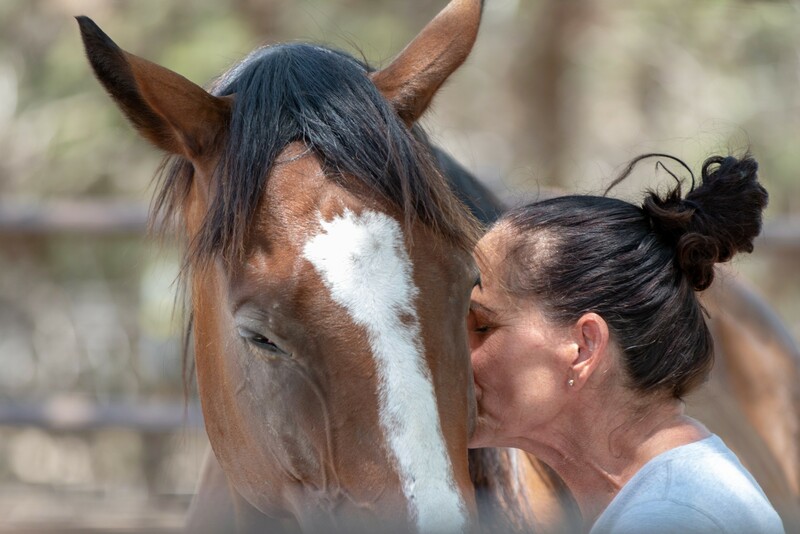 Matthew 5:4 says “Blessed are those who mourn; for they shall be comforted.” As many of you know my dream has been to bring hope and healing to humans through partnership with horses. I know in my heart that time spent with these animals is life-changing and I long for this opportunity to be available to many who are suffering – adults and children, but especially first responders and active members of our military. PTSD is real and it gets worse over time, not better. Trauma processing is necessary for healing. Stuffing emotions is like putting everything inside a pressure cooker and never letting out the steam…eventually the steam will come out, but most likely not in a way that we’d planned. If you know someone who is stuck in suffering or is coping but not thriving, please say a prayer for them and offer yourself to listen. Simply allowing for that person to share their grief with someone, to cry and to scream and angrily say “It’s not fair!” is healing. It is the opportunity for hope and a new perspective. Research shows that if we are allowed to process through traumatic events in a connected relationship with another human, the effect of the trauma is not as deep or debilitating. Disassociation is a term that we use to describe when a human simply “checks out” in order to cope. Most of us know someone who is checked out, we just don’t know what to do when it is happening and are afraid to embarrass ourselves or them by bringing it up. Engaging with that person in an authentic and caring way and allowing for safe space to share suffering, can actually help. We do a really good job of ignoring sadness and hard things in America. I hope that the stigma of grief and trauma recedes in our society and that we bravely reach out to one another in love for healing and for the better good of our community. Suffering is not the end, it is merely part of the journey. And that is where mindfulness can come in. Mindfulness works. Mindfulness is defined as actively seeking an awareness of the present moment and acknowledging physical sensations, current feelings and emotions. So, this week allow yourself time to sit quietly for 5 minutes, outside if possible and pay attention to your body’s sensations. Where in your body do you feel sad? Your throat, your heart, your stomach, your core? Now breathe into that space slowly. Pay attention to your breathe and the sensation of sadness within your body. Are you able to loosen up and breathe imaginary holes into that space? If tears are present, let them flow. Come prepared with Kleenex and give yourself permission to be sad, angry, disappointed, frustrated…it is okay to scream and kick the dirt and be angry. It is okay to be angry with God. He never left you. People may have disappointed you. People may have betrayed you and judged or criticized you. People may have hurt or abused you. But God was always there with you. He knows your heart, He knows your soul, He loves you and He can handle it. Can you share your pain with someone you trust? This sharing of suffering creates intimacy in relationships and this intimacy can help relationships grow and deepen. It is a win-win! If you have been practicing mindfulness for some time, please reflect on a recent event that brought about pain. Was your first reaction an allowing of the emotion? Or did you stuff it? Even though I have learned about and practice mindfulness, it is something that I am constantly trying to achieve, especially in the moments of stress. But admittedly my first reaction can still be ignoring and stuffing because I don’t want to burden anyone with my imperfection…I have a lot of work to do myself. Thanks for sharing this journey with me. Stay tuned for next week’s blog post on “Out of the Ashes”.